I just came back from Mongo Boston and I am really excited for 10gen. Once again I met actual human beings that were really happy about using a database and wanted to share that experience with others. Ask yourself: when was the last time you were happy about a piece of Oracle software? Have you too choked or spilled your tea reading “Easy Administration” in Oracle’s press release? But back to the point. Check out this graph. 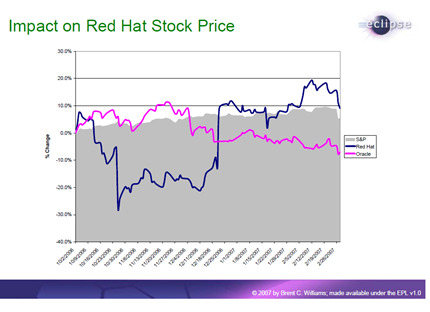 Replace Red Hat with 10gen. This picture comes from this 2007 Brent C. Williams presentation on Open Source business models. Oracle released “Unbreakable Linux” right in the middle of that graph, therefore validating the entire space. Few people adopted Oracle’s distribution and everyone went to buy the support contracts from people who actually knew something about the software – Redhat. Right now all Oracle DBAs are signing up for NoSQL training. That’s a huge win for companies like 10gen. Is anybody going to use Oracle’s NoSQL? Who cares. We didn’t need another distributed key-value store. Oracle just operates in a self-perpetuated bubble of secure software, most scalable database, 100% reliability and now leadership in the NoSQL space. They are sweating. Acquisitions will come next. In the meantime, I can’t wait for the folks at Team SHATTER to get their hands on this thing – we’re going to have some fun 0-days. Oracle Didn’t Learn From the Redhat Experience, PRs a NoSQL Database was published on October 04, 2011 . See a typo?